Dr. Napolitano graduated from the University of Florida College of Medicine in 1993 where she received the Outstanding Student Plastic Surgery Department Award. She completed a general surgery residency in 1998 at St. Louis University Hospital in St. Louis, Missouri. 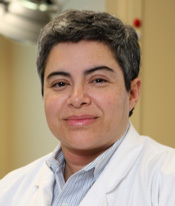 She then completed a plastic and reconstructive surgery fellowship at the University of Florida Department of Surgery in 2000 followed by a hand and microsurgery fellowship at the Christine M. Kleinert Institute for Hand and Microsurgery in Louisville, Kentucky. also boarded in Hand surgery having her CAQ. She is a Fellow of the American College of Surgeons, and is a member of the American Medical Association, Interplast, Kentucky Medical Association, Lexington Medical Society, Jefferson County Medical Society, American Society for Surgery of the Hand and American Society of Plastic Surgeons. Her special interests include general plastic surgery and hand surgery.